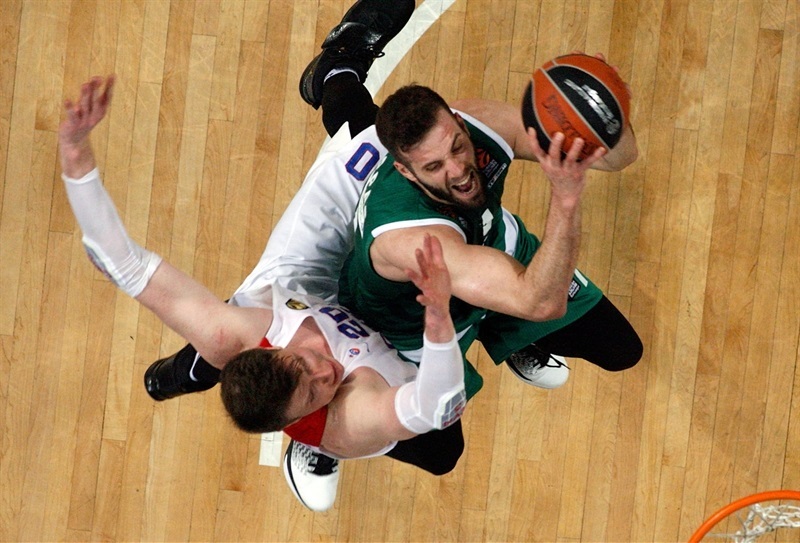 Panathinaikos Superfoods Athens hung on in an overtime thriller to defeat CSKA Moscow 85-80 on Friday at Olympic Sports Center Athens. That victory was the fourth in a row overall and the 11thstraight at home for the Greens, who raised their record to 18-11. 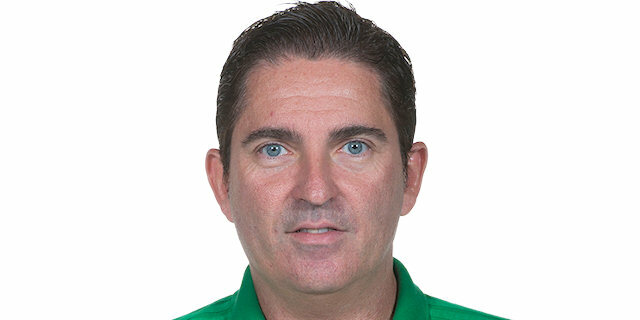 The win, coupled with Fenerbahce Istanbul’s loss at Real Madrid, put Panathinaikos alone in fourth place and Coach Xavi Pascual’s men can clinch home-court advantage for the playoffs with a win in their regular season finale next week at Maccabi FOX Tel Aviv. CSKA fell to 21-8 and will finish the regular season in second place regardless of the Round 30 results. K.C. 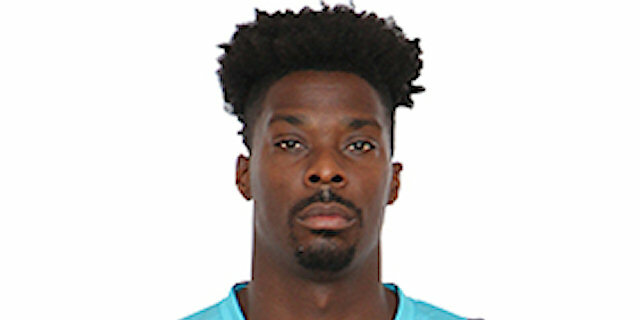 Rivers led the winners with 17 points, including a three-pointer with two minutes left in overtime from which CSKA never recovered. Mike James and Chris Singleton added 13 points apiece and Nick Calathes tallied 12 points and 6 assists and made a pair of critical free throws and forced a turnover in the final minute of regulation. 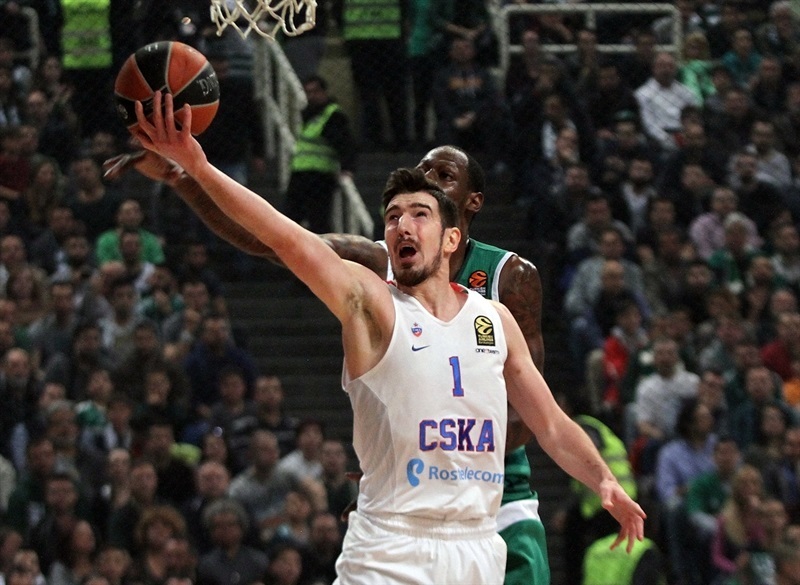 Nando De Colo and Milos Teodosic led the CSKA attack with 15 points each and James Augustine and Andrey Vorontsevich both scored 14. 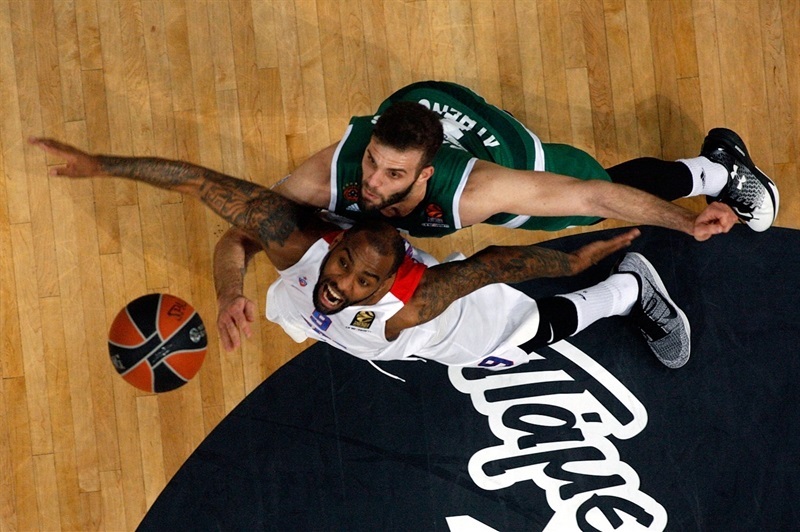 CSKA outrebounded Panathinaikos 37-44, but also committed 17 turnovers. The game was exciting from the start with plenty of steals and daring passes. Calathes connected from downtown to give Panathinaikos a 7-5 lead. The visitors found a matchup they liked with De Colo inside and fed the MVP three times for as many baskets to make it 9-11. A three by Nikos Pappas over Augustine pushed the Greens in front 16-15. Mike James drilled a jumper in the closing seconds of the first quarter to make it 20-17 after 10 minutes. 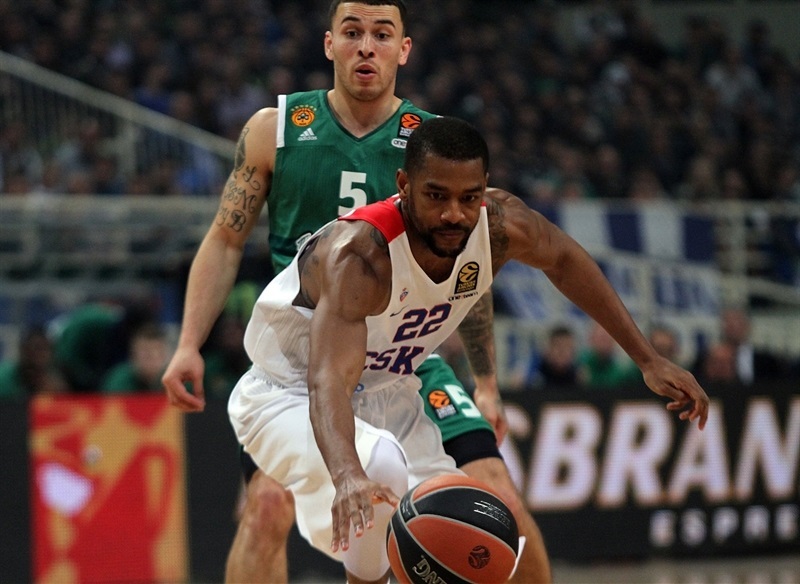 Singleton added to the Panathinaikos advantage with a three-pointer, but Cory Higgins heated up to close the gap and Aaron Jackson ran the pic-and-pop with Vorontsevich, who connected from behind the arc to put CSKA on top 28-29. James shined with a three-point play and Rivers heated up too, but Vorontsevich and Augustine the teams even. 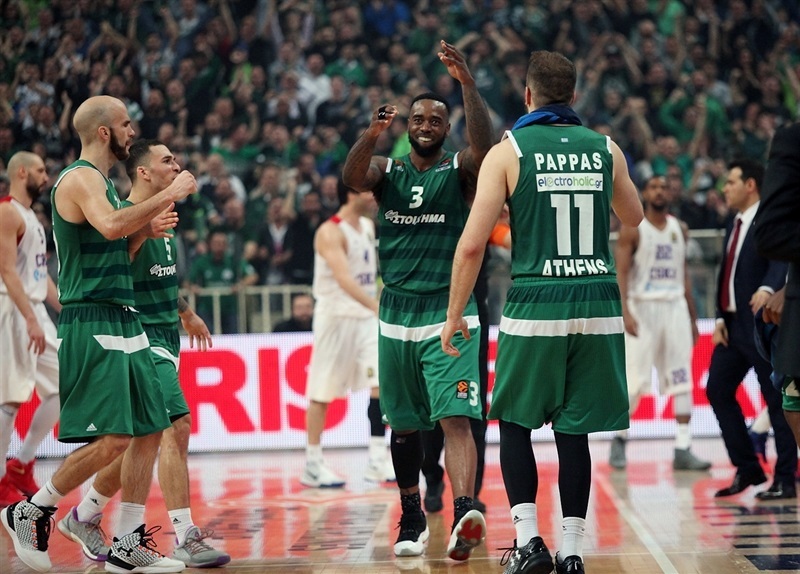 A Rivers three and Calathes steal and layup at the buzzer left the Panathinaikos crowd in a frenzy with a 45-40 halftime lead. Higgins and Kyle Hines drew the visitors within 1 at the start of the second half, but Demetrius Nichols’s steal and three-point play kept the Greens in control. Nevertheless, CSKA kept it close and tied the game at 55-55 on a three by DeColo. Free throws by Pappas made it 58-55 through three quarters. CSKA tied it twice through Augustine and De Colo before Vitaly Fridzon gave the visitors a 63-64 edge from the line. De Colo added a triple, however Rivers’s layup got the hosts back within 1 and James dropped in a finger roll for a 71-70 lead with 2:16 remaining. 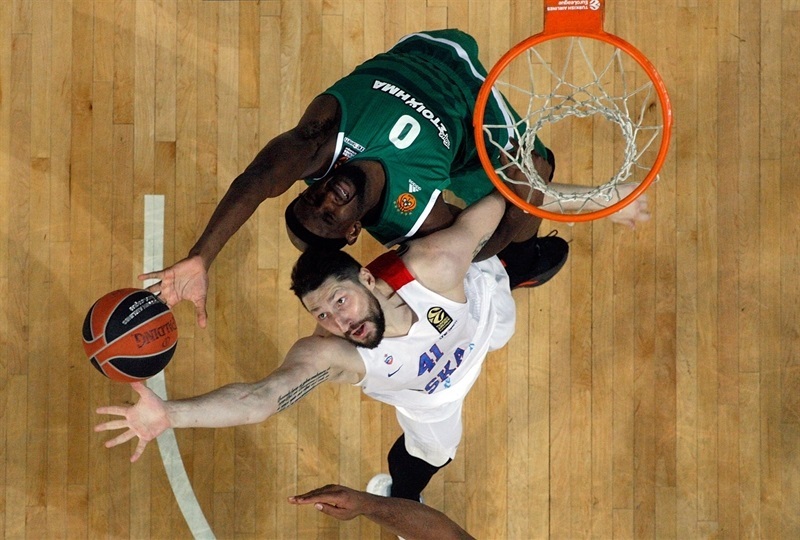 CSKA came up empty on its next two possessions, but also kept Panathinaikos scoreless. 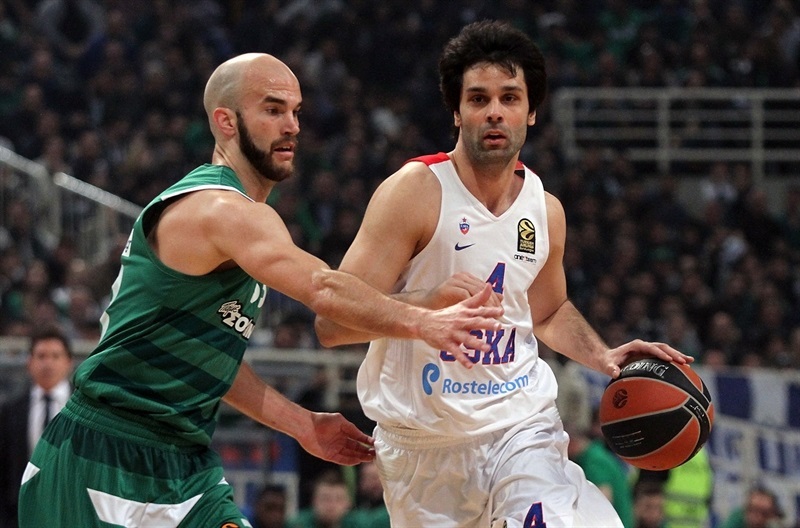 And then Teodosic struck with a pull-up three with 37 seconds left to put the visitors on top once again. Calathes tied the game with free throws with 25.8 second left and after 3 turnovers in the final 20 seconds, the regulation buzzer sounded with the game tied at 73-73. Neither team led by more than 2 points in the extra session until a three by Rivers with two minutes left made it 82-78. And the momentum remained with the hosts the rest of the way. "We are happy for sure. First I want to say thank you to the supporters that came today and helped create this incredible atmosphere. It was a very tough game. Both teams had possibilities to win. We played the last 25 minutes with only 2 three-pointers. This is why we had so many problems to score in the last 25 minutes. But in the end, playing strong defense and smart on offense gave us this important win. " "That was a game where both teams, the outcome may be different whether on Panathinaikos’s side or our side, will be well deserved whatever the outcome would be. So congratulations to Panathinaikos for winning. I will try to justify that by saying we had two different halves. 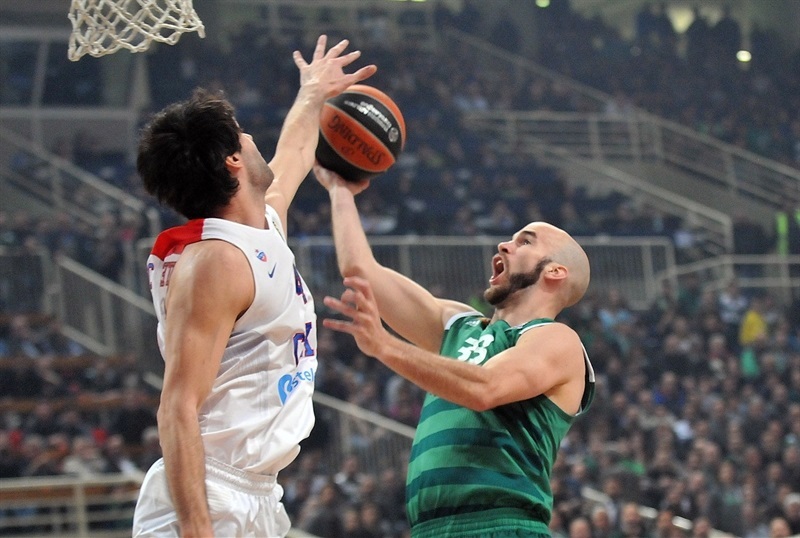 The first half belonged to Panathinaikos offensively; they managed to score a lot of buckets in half-court possessions. 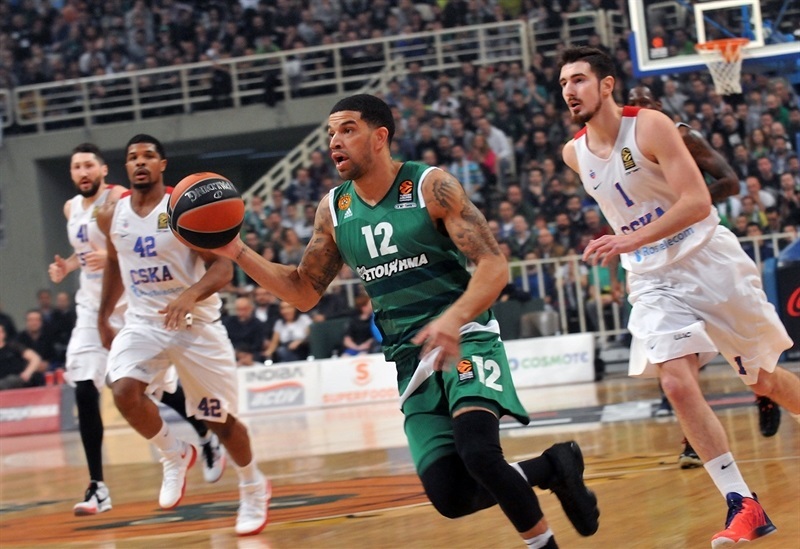 We established some good fighting on the boards and we managed to win the rebounds, which is a big part of Panathinaikos’s power, but in the second half we came out strong, we were the better team and we took the momentum. 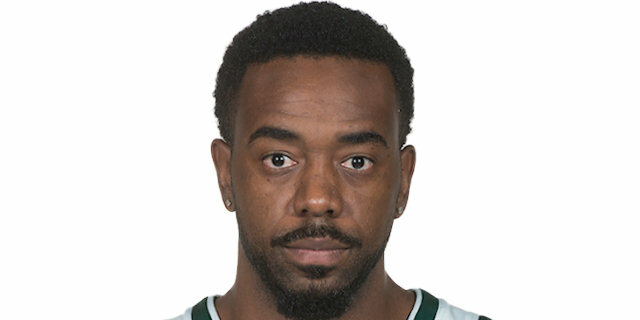 With something like three minutes to go, Panathinaikos made some big plays and we went to overtime, where they made better plays than us and they won the game. So congratulations." "Today was a real tough game. We played for 45 minutes, but most importantly we played together. We went out there and had fun and were able to bring home the win. We have one more game against Maccabi, hopefully we go over there and take care of business and get this home-court advantage for sure. " "Wow. It looked like it was going to be a tragedy at the end and we found a way to get a stop and try and win it in overtime. And with the help of the energy in this arena, the crowd, we got it done. It took a strong effort defensively and we had some ups and downs, but for the most part we were solid and offensively we were solid at the end. "